There have been a number of introduction songs that Nine Inch Nails plays themselves or plays recordings of before the main set begins. Intro (Purest Feeling) aka "Slate", "Theme From the Right Track Studio" - used as the intro track on "Purest Feeling" and more or less flows into Sanctified. It's not known if this was used for the Skinny Puppy support tour in 1988. Intro (extended Terrible Lie Intro) - Used during Support Tours in 1990. Intro (hybrid Hate 90-extended Terrible Lie) Used when opening for Jane's Addiction in 1991, only one recording. Now I'm Nothing - Played during the Now I'm Nothing tour in 1991 which included the inaugural Lollapalooza Festival. Most of the lyrics were recycled into Gave Up and Hurt. There is a soundboard recording on Lollapalooza documentary and Closure DVD. Now I'm Nothing resurfaced on the 2009 NINJA tour after having not been played for 18 years. Pinion - Every show during the Self Destruct Tours opened with Pinion. Part one with Pinion-Terrible Lie, and part two with Pinion-Mr. Self Destruct. Pinion isn't actually played, it's a recording. The song slows down prior to the first played song. Pinion has also been used as an intro during With Teeth and Performance 2007, sometimes with the New Flesh. The New Flesh/Pinion - Every show during the Fragility Tours opened with these two songs blended together, again both recordings. On at least one occasion (Yokohama), Trent sings lyrics to The New Flesh. Festival shows in Australia and Europe opened with Head Like a Hole. Intro (Beside You In Time) - Recording of part of BYIT was used at the start of many shows during the first legs of the With Teeth Tour in 2005. Pilgrimage - frequently used a reworked recording of the song during With Teeth Winter Tour 2006 and the first European leg of Performance 2007. Hyperpower! - Played at the start of shows during Performance 2007 (Japanese, Australian, and European Summer Festival legs). 999,999 - Every show during Lights in The Sky opened with this recording, except Guadalajara. Intro 2009 - Starting in 2009, when a show started with 1,000,000 a new long extended introduction would precede it. Includes humpback whales. Reptilian? 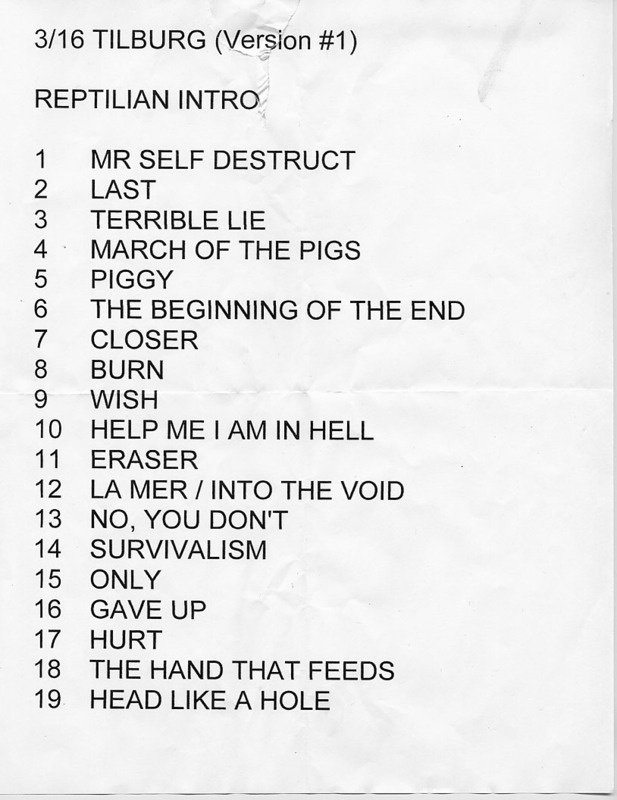 - may have been used at Tilburg, Netherlands 3/16/07, there is no confirmation or recording though, just this setlist.